Sumit Bansal did bachelor of technology in biotechnology from Jaypee Institute of Information Technology University and MBA in finance from Indian Institute of Technology, Delhi. Over the years, he has worked with various companies including, Grail Research, The Smart Cube, IBM, and more. It was while working as a financial analyst, Sumit became passionate about using Microsoft Excel. Learning something new about Excel software every day, he felt the need to share that knowledge with everyone. 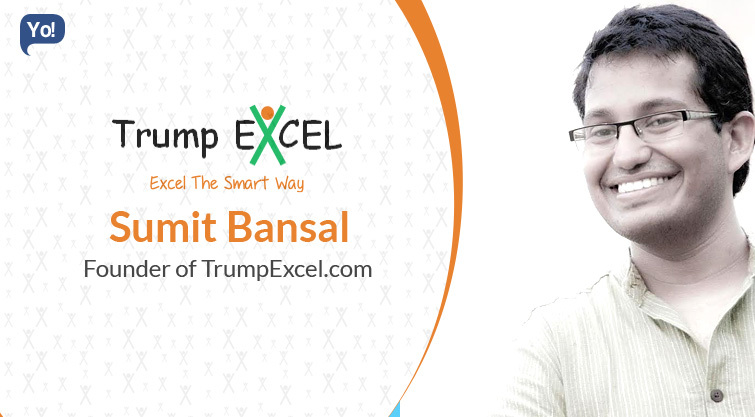 In 2013, Sumit conceptualized TrumpExcel, which is an online platform to train people in Excel Spreadsheets. TrumpExcel.com is an online platform to train people in Excel Spreadsheets. You can find a lot of free tutorials, videos, and templates. You can also enroll for the paid courses that give you access to HD quality videos. Once you complete a course, you can request for a course completion certificate. I was learning something new in Excel every day and I could see people struggling with small things. So I thought of sharing what I know by creating tutorials and videos. Once I saw that there was a potential for courses, I created paid online courses. Help people first, money will follow. Technology – I had no clue how to build a website, get email subscribers, create and launch courses and manage to pay customers. When you log in to a website or access a course, a lot of things work together in the back-end, and it’s imperative that they work in tandem. It took me a lot of time and money to get the right technology and products that best suit my requirements. By spending hours in research and connecting with the experts. Google and Facebook groups proved to be my best friend here. For every technology/product, I read hundred of reviews on forums and connected with people who were already using these. Once I had the knowledge of Pros/Cons, I could make an informed decision. While I have been contacted by many people/companies for partnerships, so far I have not considered any. Ability to adapt – things change at lightning speed and you need to give your customers the best experience by choosing the best in the market. Perseverance – there are no overnight successes and quick wins. Networking skills – connect with people reach out for help whenever you need it. Working in chunks for 30-35 minutes with regular breaks. I have a POMODORO app installed on my phone and I try and stick to it. My inability to switch off from work. Be action oriented. If you think you have a good idea, try it out. Don’t ignore your health. Work hard, but don’t kill yourself. Listen to your customer – they know the best. In next three years, I plan to launch more courses and expand my customer and email subscriber base. I am pretty happy with how it panned out. I just wish I had started blogging earlier.